This might be one of the only times that I wished I had Windows Vista. Then I could have written this post by hand. I’m sure a lot of you are saying: “But we can’t read your handwriting”. And you should, because my handwriting is sloppy. However, with Windows Vista and the Wacom Bamboo Pen Tablet, all my printed words can be easily transferred into typed text. If you haven’t heard of the Wacom Bamboo, it is a very sleek device that includes a pen tablet and digital pen for lots of drawing potential. Not only can a user write-to-text, but he or she can make sketches, or add his or her personal signature to digital documents. The feeling of the Bamboo is just like pen-on-paper, and I found that it was not at all awkward to work with. The pen tablet even comes with a Touch Ring that can do zooming and scrolling with the touch of your finger. There are also four ExpressKeys that provide shortcuts and macros to some of your most common used tools. 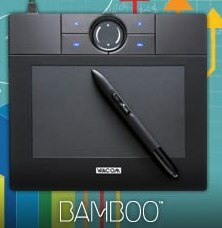 The Wacom Bamboo Pen Tablet is available at the Wacom site for about $79.00. You can also purchase the Bamboo Fun, but that has so many features that it is worth a separate article.